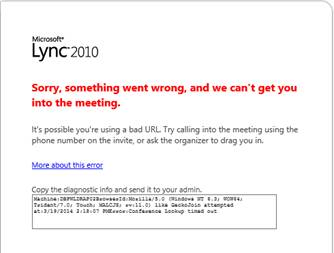 Recently I’ve encounter a problem in which Lync 2010 simple URL’s were not redirecting traffic towards the Lync 2013 FE pool. Change the simple URL’s to point to Lync 2013 server instead of Lync 2010. that seems to work perfectly both on the internal and the external networks. The only cons for that approach is that in case of co-existence mode, while the Lync 2013 is still considered to be a pilot pool, the change force it to act as a production pool by forwarding all existing communication to Lync 2013 first and redirect it to Lync 2010. After applying the change and perform IISRESET, the Lync 2010 server were redirecting both internal and external meeting towards the Lync 2013 servers. The Director (when simple urls DNS Records point to the Director pool) requires that it can communicate on TCP 444 If tis traffic is hindered from Director to FE (FE Pool listening on 444) then you will find the issue above and essentially bandaging an underlying network issue with the config options above..